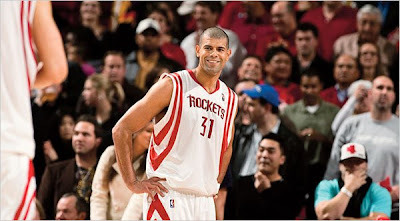 Shane Battier of the Houston Rockets. Photo by Robert Seale. Source: New York Times. Last season when the Rockets played the San Antonio Spurs Battier was assigned to guard their most dangerous scorer, Manu Ginóbili. Ginóbili comes off the bench, however, and his minutes are not in sync with the minutes of a starter like Battier. Battier privately went to Coach Rick Adelman and told him to bench him and bring him in when Ginóbili entered the game. "No one in the N.B.A. does that," Morey says. "No one says put me on the bench so I can guard their best scorer all the time." Battier is one of those players who is undervalued. But the Houston Rockets, like the Oakland A's, seem to be one of those teams who want to embrace the dark arts of new statistics, which actually tell you more about a player's effectiveness than conventional measurements. You can read the full article here.